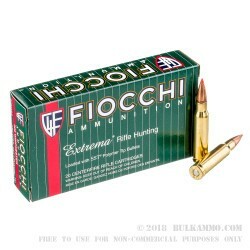 A deer season staple in the recent past few seasons, the Fiocchi Extrema Hunting line utilizes a 150 grain .308 projectile that is made by Hornady under the SST line (Super Shock Tip). This projectile is a great deer bullet with the appropriate 150 grain weight and the high weight retention for the lead core projectiles. The polymer tip enhances flight path, trajectory, expansion uniformity and diameter of total expansion. The SST has a special couple of features that enhance the jacket and core connectivity leading to a better retained weight and more energy delivery upon impact and penetration. 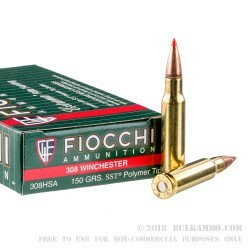 The Fiocchi Cartridge uses good quality powder (which it makes in-house in Italy) and offers a brass case and Boxer Primer to make the spent casings easily reloadable. 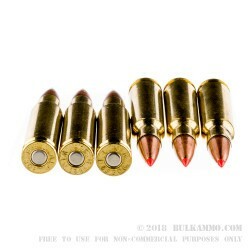 The price point is competitive with other hunting rounds and even offers a small discount to the other offerings while still implementing a premium projectile from a third party. 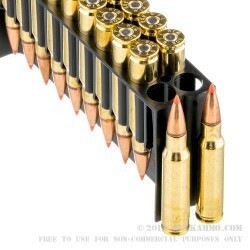 That’s pretty impressive for a hunting round that can achieve sub minute of angle accuracy, is priced as well as other no name component builds and is reliable. Fiocchi has been in the American shooting market for decades; just recently they have been getting more innovative and pushing the limits of the price points they operate within, and because of that, it’s an exciting time to be a hunter and sport shooter.